Meet Aryeh: future marine biologist, swimmer and singer! 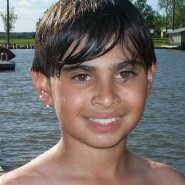 Home » Success Stories » Meet Aryeh: future marine biologist, swimmer and singer! B: What is your name? B: How old are you and where are you from? A: I am 11 years old and I’m from Houston, Texas. B: How long have you had Tourette Syndrome? A: I have had tics since I was 6 years old, and have had TS since I was 9. B: What kinds of symptoms do you have? A: My motor tics are shaking my head, pushing my arms out to touch something, and sometimes full body spasms. My vocal tics are grunting and squeaking noises and clearing my throat. B: What is life like for you living with Tourette Syndrome? A: It can be really annoying and I feel like I’m weird but I’ve learned that everything I do can be just as fun even though I have TS. B: What advice can you give other kids who are newly diagnosed with Tourette Syndrome? A: TS doesn’t define you. You’re going to have to go through things that other kids without TS have to as well, except with TS it makes you twice as strong! B: What is the hardest thing about living with Tourette Syndrome? A: Having a tic and everyone asking you if you’re ok or what’s wrong with you? Even though you know, nothing is wrong. B: What do you think other people should know about Tourette Syndrome? A: We’re still normal kids and can fit in just like everyone else. When people hear TS, they should not think “weird”. B: What are your strengths and what do you like to do? A: I’m friendly and very forgiving. I have a good sense of humor. I love singing and have an amazing voice, swimming, martial arts, soccer, cooking, and being with my friends. B: What are your goals in life? A: I am going to be the first marine biologist to train wild orca whales in the wild. Wish you could personally know this bright, fun-loving fellow. Aryeh has a fantastic sense of humor and he is so very sensitive. His insight into his condition is way beyond his years thanks to his parents and big sister. We enjoyed reading his Q and A and wish everyone in our family, in his school, EVERYONE in his entire world could understand what he endures. Folks need EMPATHY and perhaps folks like you and Aryeh are put here to help TEACH it. Thanks for the article. We are sooo very proud of our grandson.